Who wants her job next? It should come as no surprise to anyone that a political scientist like me gets really excited about elections and campaigns, and we’re currently in the thick of a doozy of a campaign season. Candidates have splashy websites and brochures, and they regularly meet with voters to pitch their candidacies. Whoever wins will take over an organization whose standing in the world is up in the air—and the winner will have a big job restoring the organization’s place in the larger global landscape. Of course, I’m talking about the campaign for the next Director-General of the World Health Organization. What else would I be describing? Selecting a new Director-General for WHO is not in and of itself out of the ordinary. Director-Generals have a five-year term of office, and are limited to two terms. 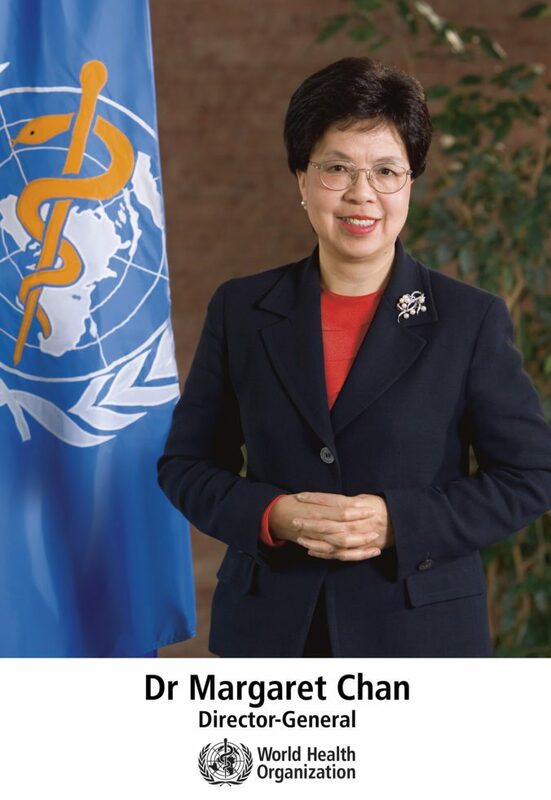 Current DG Margaret Chan took office in 2007, so someone new will need to step into the role. Whoever gets the job will have the monumental task of trying to rebuild WHO’s legitimacy and reassert its primacy in responding to global health concerns. Chan has come under severe criticism for her handling of the Ebola crisis, but others have defended her actions as being the best she could do under severe structural constraints. The new Director-General will have to address these perceptions and show the world why WHO still matters. What’s different this time around is how public the process will be. In the past, the process of selecting the DG was conducted almost entirely in secret. Nominations were not public, so there was no larger discussion of the DG’s vision. The WHO Executive Board put forward a single candidate for approval, and the World Health Assembly rubber-stamped the nomination without much of an opportunity to really get involved. This lack of transparency has raised questions in the past. There’s also been an issue with the lack of geographic rotation. There is an informal principle within the United Nations of regional rotation, but that has not really been applied to WHO’s top job. Since 1973, all of the Directors-General have come either from Europe or Asia, and there has never been a Director-General from Africa. That said, some states have objected to earlier efforts to pay more attention to regional rotation in selecting a DG by arguing that it would risk sacrificing technical expertise for geographic considerations. This time around (and in line with the efforts to make the selection of the UN Secretary-General more transparent), electing a new WHO DG really is an election. The 2014 World Health Assembly adopted a resolution that details how the new DG will be elected. If the process plays out as described, WHO’s 194 member-states will have a genuine choice to make in May. Let’s say you, dear reader, hope to take the highest office on Avenue Appiah in Geneva. How would you get there? First, you would have to get nominated by one of WHO’s member-states. For the current election, nominations officially opened in mid-April and closed in mid-September, but candidates had been informally campaigning and building support before then. Of course, you can’t simply run for the office without having any sort of relevant background or experience. (What kind of political system would allow for something as crazy as that?) The World Health Assembly announced nine criteria for DG candidates. They include things like a strong technical background in health and experience in public health; extensive international health experience; a strong commitment to the goals and mission of WHO; and good health status (particularly relevant after Jong-Wook Lee’s untimely death in 2006 during his first term as DG). If the Executive Board deems any of the candidates as not meeting these criteria, it can strike their nomination. If you make it through this first round, you will spend the month of October publicly campaigning (which the resolution specifically allows) and participating in a password-protected web forum to interact with member-states. In November, your campaign will go far more public. On the 1st and 2nd of November, all of the candidates will participate in a live forum where they will describe their visions and goals for WHO. These forums will allow member-states to ask questions of the candidates and be streamed on the WHO website. After the first of the year, the winnowing process begins. The WHO Executive Board will use secret ballots to reduce the candidates to five, interview the five people on the short list, and vote on the final three—and those three names are the ones on which the World Health Assembly will vote in May. Laurie Garrett has raised concerns about this process, arguing that the lack of campaign finance regulations could corrupt the process away from public view. If your candidacy makes it through the Executive Board, then you will have roughly four months to campaign among the member-states. To win the election, you will need the support of two-thirds of the Members present and voting—or about 130 votes—in the first round. If no candidate achieves that, the lowest candidate will be dropped and another round of voting will occur. If no one receives two-thirds of the vote in the second round, whichever candidate gets a majority in the third round will be elected. If that’s you, congratulations and get ready for your move to Geneva! The big question at this stage is whether the actual election process will mirror what is described and whether it will lead to greater transparency. If the UN Secretary-General election process is any guide, there is reason to be sceptical. I’d call myself pessimistically optimistic (or is it optimistically pessimistic?) that WHO will follow its procedures—but we’re definitely in uncharted territory here. But wait, you say. I’m not running for WHO DG, so who is? That’s an excellent question, and I’ll talk about the candidates and the campaign so far in my next blog post. Women’s Lives Matter. So Do Elections. WHO is seeking to fill its position of Director-General and Africa has endorsed its world renowned expert in the health sector, Dr. Tedros Adhanom, currently the minister of Foreign Affairs of Ethiopia. He oversaw the implementation of a comprehensive reform that changed for good Ethiopia’s health system, which resulted in reducing infant mortality and AIDS; extended health access for millions of Ethiopia; invested in the sustainable development structure and mobilized the health workforce; and developing innovative funding mechanisms.